Michael J. 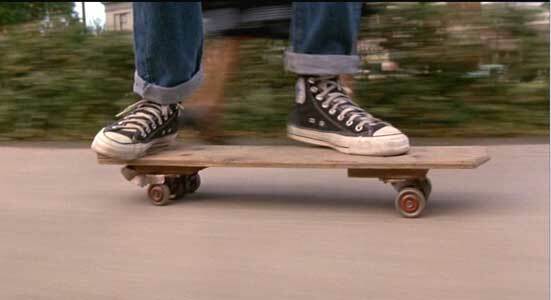 Fox wears black high top Converse “Chuck Taylor” All Stars in the film. 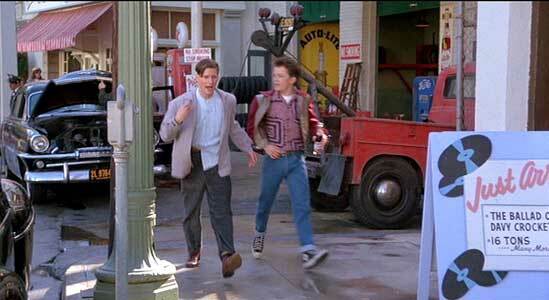 Marty McFly meets his dad as a teenager in Back to the Future. Back to the Future is a combination science fiction/comedy about a suburban teenager, Marty McFly (Michael J. Fox), and the adventures he has with his best friend, the eccentric scientist and inventor Dr. Emmett Brown (Christopher Lloyd) who has invented a time machine. Marty is portrayed in the film as being very “cool” by teen standards: he’s an expert skateboarder, plays guitar in a rock band, and has a serious girlfriend, Jennifer (Mary Steenburgen). In contrast his home life is rather pathetic: his unhappy mother, Lorraine (Lea Thompson), drinks a lot, criticizes her daughter for calling boys on the telephone, and tells Marty she doesn’t approve of Jennifer. His brother and sister are rather mean spirited and unambitious, and his father, George (Crispin Glover), is a sniveling nerd, still terrorized and ridiculed by former school classmate and bully, Biff Tannen (Thomas F. Wilson) who is now his boss at work. As the film opens, we see that Biff has just wrecked the McFly family car he borrowed, and is still making George do all of his work for him, so he can recopy it and submit it as his own. So it’s no wonder that Marty spends most of his time with Doc Brown. One of the best features of the film is all of the “Rube Goldberg” type of inventions that you see Marty and Doc using. Marty creates a skateboard out of a kid’s soapbox car. The story gets moving when Marty gets an excited call from Doc to meet him at late at night in the Twin Pine Mall parking lot with his video camera. The time machine, built out of a DeLorean, actually works, but requires a high powered energy source like plutonium, which Doc acquired by stealing it from Libyan terrorists. Just as they have observed a successful test on Doc’s dog, Einstein, the terrorists show up and shoot at Doc with their machine guns. Marty escapes by driving the DeLorean in a high speed chase, but when he reaches the speed of 88 MPH, the machine activates and Marty ends up traveling back to the year 1955. When Marty tries to return back to the eighties, he discovers that the fuel reserve is on empty, and he is stuck. His only hope of returning is to find the young Doc Brown and enlisting his help. Marty finds the address in a phone book, but on the way to his house, he accidentally messes up the space time continuum for his own family by saving his young father from getting hit by his grandfather’s car and getting hit himself. So instead of Lorraine nursing George from the accident and falling in love with him, she instead is nursing Marty and becoming infatuated with Marty. The result: the future McFly family begins to disappear, as seen in a photo Marty has in his wallet. When Marty is finally able to hook up with Doc Brown, and persuade him that he really is from the future by showing him the video of the time machine and the flux capacitor, Doc points out the two problems he faces: getting his parents to fall in love with each other like they are supposed to, and figuring out how to generate 1.21 gigawatts of power to restart the car in an era where plutonium doesn’t yet exist. 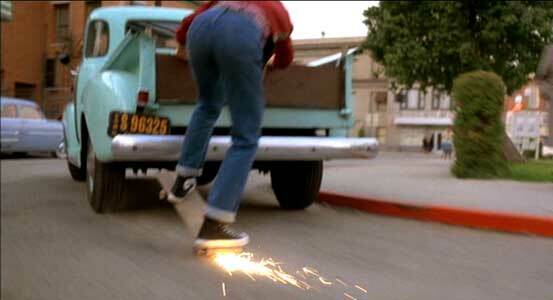 Marty grabs onto the back of a passing truck to hitch a ride and escape Biff. Luckily for Marty there is a solution. The town clock tower had been hit by lightning in the fifties and because he donated a quarter to the fund to preserve the clock, Marty was given a flier that states the day and exact time the clock tower was hit. The bolt of lightning will have enough energy to power up the capacitor if Doc Brown can figure out a way to harness it. The other problem is more difficult. He has to help his geeky father court Lorraine, win her over, and go to the Enchanted Under the Sea dance where they are supposed to kiss for the first time and fall in love. And for George to become more manly, he is going to have to stand up to his personal tormentor, the town bully, Biff. The clever and entertaining ways that Marty and Doc set out to accomplish these goals is the bulk of the story. 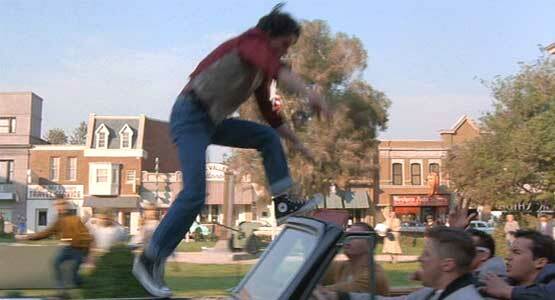 When Biff and his friends catch up to Marty, he escapes by jumping over their car. One of the things that makes Back to the Future work so well as a film is the attention to details and the comedy that is generated by the contrast in attitudes and lifestyles between the fifties and the eighties. When Marty walks into a drug store to find a phone book and the owner asks him why he is wearing an inner tube (his sleeveless parka), or when Lorraine calls him Calvin because she saw Calvin Klein embroidered on his underwear, or when Marty sees a car drive into the Texaco station and four uniformed attendants come out and service the vehicle with the speed of a race track pit crew, you are reminded of how much things change in a generation. And the inverse of this is when you see Marty introduce skateboarding to the town kids while trying to escape Biff and his gang, or when he performs Johnny B. Goode at the dance before it was written and you see one of the band members Marvin Berry, call up his cousin Chuck and say, “You know that new sound you’re looking for? Here it is!” Another great music bit is when Marty forgets what time frame he is in and starts playing a metal-like guitar solo all over the stage, kicking amps, and creating feedback. Suddenly realizing that no one else is playing and the entire crowd has stopped dancing and is staring at him, he says, “I know that didn’t seem like much to you, but your kids will love it.” Besides this music there is “Earth Angel” and an original score by Huey Lewis and the News. Director Robert Zemeckis deserves a lot of credit for keeping the action well paced, the audience on the edge of their seats, and for the fine performances he achieved from the cast. In fact, he is responsible for putting Michael J. Fox into this film after a lot of it had been shot, because the on screen chemistry between the lead characters wasn’t working. (Click here for details.) Fox’s energy and enthusiasm make the film work, and he is a good foil for Christopher Lloyd, who always acts as if he actually believes the scientific flim-flam he is saying. Crispin Glover as George comes across as a wimp’s wimp, and no one can accuse him of underacting in this role. Lea Thompson is a study in contrasts as you see her very different behavior when she is a teenager as opposed to her character as Marty’s mother. And Thomas F. Wilson seems to relish his role as Biff the town bully, the guy you love to hate. But the best part of this film is the closing scene after all has been resolved. Imagine what it would be like if you were able to change just one or two incidents of the past. Because of those little changes Marty made in his family’s space-time continuum, he gets to experience a very different life from what you saw in the opening scenes. 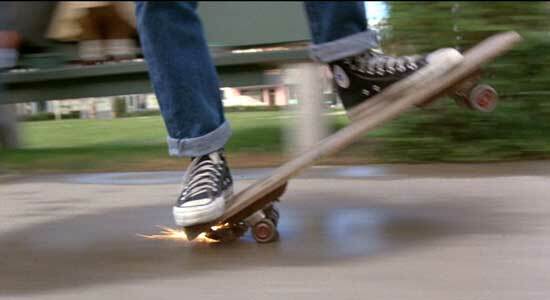 Marty glides along on his makeshift skateboard. 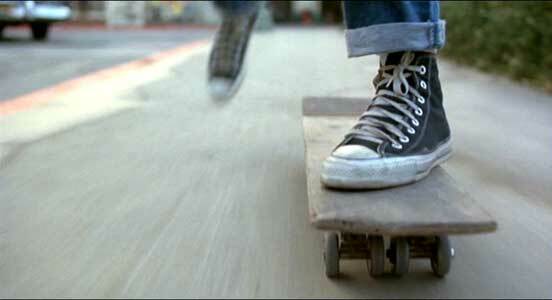 Marty quickly accelerates on the skateboard to escape Biff and his gang. Although Back to the Future makes a lot a fun out of the differences between the fifties and the eighties, there are a few things that actually bridge the gap. When Marty realizes that he must change his style of dress to fit into the times, yet basically not give up the clothes he likes to wear, you see a switch to black All Star high tops, jeans with turned up cuffs, and 50’s styles shirts and jackets. (Of course he could have worn his chucks and jeans in the eighties and fit right in.) Still the same cool Marty, but with more of a retro look. It’s good that he did change his outfit, because there is no question as to the best chucks scene in this film. 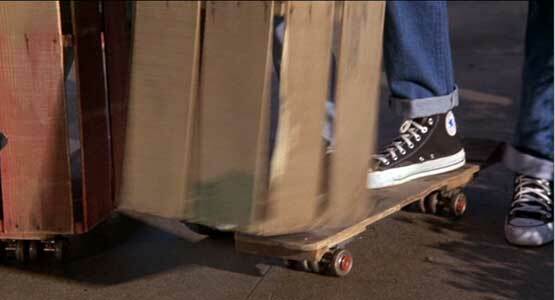 It’s the skateboarding sequence, where Marty has tripped Biff in the soda shop, to give George a chance to ask Lorraine to the dance, and then to escape the wrath of Biff and his gang, Marty creates a fifties-style skateboard from the base of a town kid’s soapbox car. This whole sequence features some great closeup shots along with great stunt work and action. This scene is definitely one of the highlights of the film, even if you don’t care about the chucks. But their presence really focuses your eyes on the fancy footwork throughout the scene. Marty does some fancy footwork in his chucks. Back to the Future. (1985) Michael J. Fox, Christopher Lloyd, Crispin Glover, Lea Thompson, Thomas F. Wilson. Directed by Robert Zemeckis.